Wow - it's another Paper Pumpkin project! I absolutely love the die cuts in this kit... it just makes me want to hoard them forever and ever. Mostly I like to scrapbook them... Yup, I adore it! 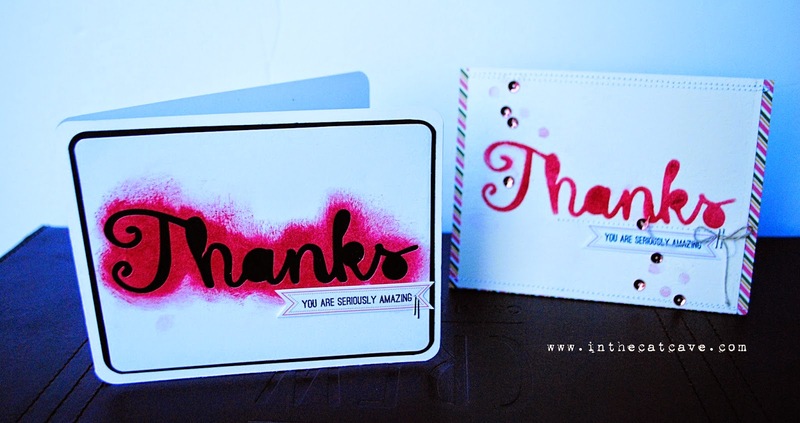 So, the card on the left is the die cut I used to sponge the "Thanks" on the card on the right. It's hard to tell in the photo. I had a hard time throwing out that "dirty" die cut so I made a quick card! It's almost like a 2 for 1 deal!! This is the last project for the My Paper Pumpkin Challenge for September - Make sure you play along with the challenge by the end of the month! Click on the icon below for more info!